Bee Swarms or Hives should be removed, LIVE if possible, when they pose a health & safety risk. Bees in the Phoenix Valley often start new hives in places that pose a health risk to people close by. When a bee colony has started to make a hive or has established a hive on your property, then it is time for Professional Bee Removal. The hive and honey must be completely removed, and the area sealed, to guarantee against future re-infestation or infestation of other pests. Bees are extremely important to us… Without them, we could starve, and would not have tomatoes, grapes, blueberries, cocoa, cranberries, vanilla, eggplant, sesame, melons, squash, and many other foods! We recommend instead of Pest Control you contact The BeeMan for LIVE Bee Removal in Phoenix & surrounding areas. They’ll COLLECT swarms or hives to allow for future pollination. We do not recommend trying to remove Bees on your own! Did you know Honeybees are more dangerous than Arizona SCORPIONS and snakes? Bees kill more people each year than all the poisonous snakes combined. Check your property regularly for bee hives. Check water meter boxes, irrigation boxes, BBQ’s, trash cans, trees, and bushes. Keep Still if you discover a bee hive close by. Bees are more likely to attach a moving object than a stationary one. DO NOT: Destroy, Remove, or Exterminate a hive on your own! Attempting Bee Control without proper training & equipment has led to serious INJURY and DEATH. 2. While Running as fast as you can, try to cover your head. Bees target your head and eyes. 3. Get INSIDE the closest car or home! If bees get into the car with you, drive a quarter mile or so, and then let them out. (They’ll go back to the hive.) Inside homes, Bees get disoriented, and they go to windows. If the house is cool, Bees will drop off you. When a Bee colony matures and gets too big, the colony splits. Swarming bees leave the old colony with a new Queen Bee in search of a new home. Bee Swarms are very common during Spring and Fall in the desert. These bees fill their bellies with honey for energy before they leave their old colony. Swarming Bees use lots of energy to relocate causing them to be less aggressive, and less likely to sting. 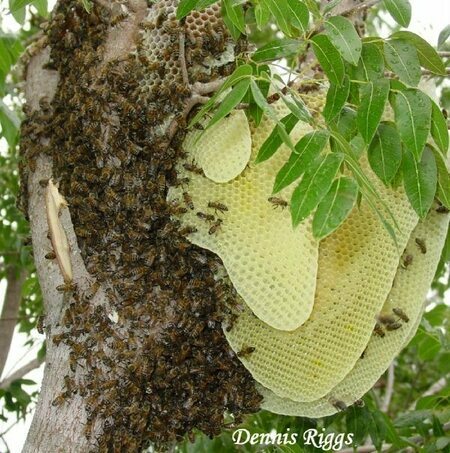 Another reason Bees aren’t usually aggressive when swarming is because they have no hive to protect!!! Often we get phone calls from alarmed residents who see a SWARM of bees close to their home. When you see a large cluster (swarm) of bees, they are resting on their journey for a new home / new colony. (For bee keepers, this is prime time to capture the swarm!) Often they will rest on trees or homes in a large ball mass. Masses of swarming Bees are resting, and they usually leave within 48 hours. During this time Bees aren’t usually aggressive because they have no hive to protect. Bees… We can’t live with them & We can’t live with out them!!! Honey Bees are responsible for $1.2 BILLION ~ $5.4 BILLION in agriculture pollination in the United States each year! (A third of the worlds food.) Bee HEALTH is a big concern as “Colony Collapse Disorder” continues to grow. Colony Collapse Disorder is when worker Bees DISAPPEAR; leaving behind their QUEEN Bee, food, and nurse bees. This last year was one of the worst on record for US Beekeepers, with some losing up to 60% of their Bee hives. ONE in every THREE bites of food we take comes from pollinated plants and animals that depend on Bees for pollination. But Bees have been mysteriously dying since about 2006. Since then ONE-THIRD of honey bee colonies in the U.S.A. have vanished! Without Bees many Farmers and crops would fail, leading to sharp rises in food costs. Help feed Bees by planting a native flower garden! SPONSOR a hive! If you can’t start a hive on your own, DONATE to a BEE PRESERVATION organization! SUPPORT your local BEE KEEPER! You can do this by buying their honey & bee products! Let your Family and Friends know the importance of Bees and how they can help! Have a LOCAL Bee Keeper or LIVE Bee Removal service collect any Arizona Bee SWARMS for SAFE Keeping! Delivering Pest Control for Bees and Bee Hives in Mesa, Phoenix, Glendale, Gilbert, Scottsdale, Chandler, Queen Creek, AZ & surrounding areas.